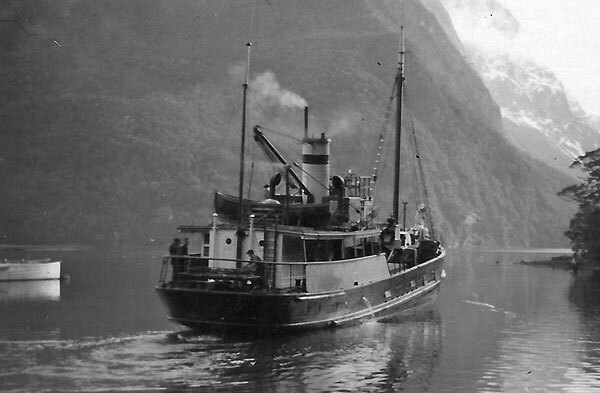 In the Spring of 1952, when the tunnel work had recommenced, a Westport building company started to shift men and material into Milford Sound for preliminary work on the new Tourist Hotel. As part of the contract the Tourist Department handed over the old hotel to the builder to provide accommodation for quite a large workforce and visiting subcontractors. The Manager and his wife retained their flat and the mechanic and I kept our rooms, but the cook, the maid and the handyman finished and left the Sound. The Tourist Department had agreed to provide power, hence the mechanic staying on, and the Post Office was to provide facilities for the workers’ payroll (more about that later). The staff dining room was extended and everyone in the Sound ate there (except the Manager and his wife who catered for themselves in their flat). At the same time, construction of a aircraft landing strip was commenced. 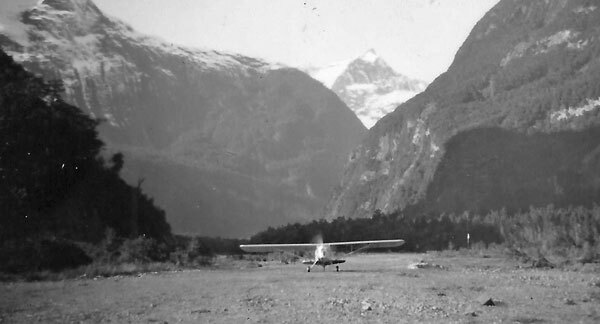 Southern Scenic Air Services, based in Queenstown, had seen the possibility of business and, with the support of the building company, had obtained permission to construct an airstrip on the Cleddau delta adjacent to the hotel. During October and November that work took place. In keeping with the times, it was constructed by just one man driving a quite small Caterpillar D4 bulldozer. It was a simple shingle airstrip on the site of the present 29/11 runway. Initially one had to wade a small creek to get to it. Air traffic into Milford was not unknown; Jim Monk with his Invercargill-based Grumman Widgeon amphibian occasionally flew in and out, operating off the water. The two photographs below, taken on “opening” day of the new airstrip, show the arrival of the first aircraft, an Auster J5 flown by the owner of SSAS, Fred (Popeye) Lucas, and accompanied by one Barry Topliss. The airstrip had an immediate benefit, in that there were more regular deliveries and sending of light mail throughout the year. 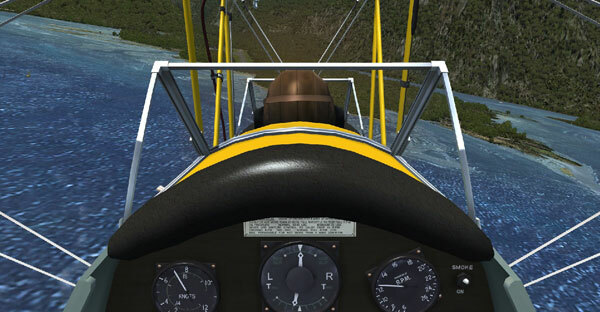 As well, a big concern at the Sound had always been how to get people to hospital in the case of accidents and urgent medical treatment; with the arrival of air service, Queenstown was now less than an hour away. One of the real difficulties faced by the building contractor was the delivery of material for the quite massive concrete work involved in the construction of the new parts of the hotel. The small motor vessel Hauiti made a number of visits to the Sound loaded with the necessary materials. We got to know the members of the crew and this was handy when we wanted personal items that were not available in the Sound. This vessel in 1954 struck the Awash Rocks, just south of the Brothers Island in Cook Strait, and sank within 30 minutes. The crew got away in the lifeboat but heavy seas were running and their safety was in doubt. The Master had managed to get a distress call away and Wellington Radio ZLW alerted the collier Kokiri that was close to the Brothers Island. That vessel picked up the nine crew and proceeded immediately to Wellington. Sadly the motorman, one WH Harding, later lost his life when Holmglen foundered in 1959. 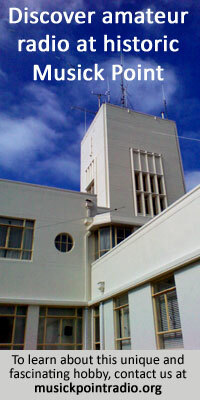 Until January 1953 the main activity of the Construction Company was establishing their management team and, together with the electrical and plumbing subcontractors and a relatively small number of tradesmen, preparing the site for the main construction work which would commence shortly after the New Year. 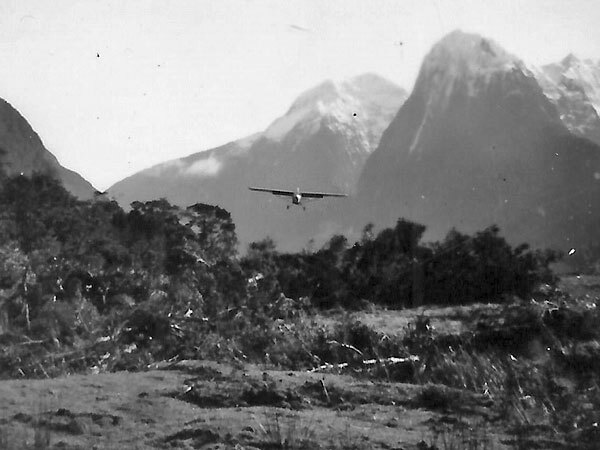 Clyde Williams was radio operator and postmaster at Milford Sound, 1952-1954.